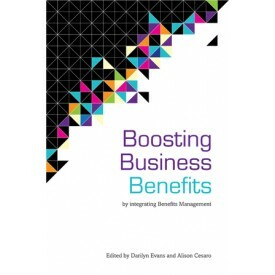 Integrating sound Benefits Management practices has been made easier with the publication of Boosting Business Benefits by the Benefits Institute. The book is available in both hard-cover ($24.95) and eBook formats ($9.95). There is just over 80 pages of useful tips and observations. This includes a detailed explanation of how benefits management was introduced at ASIC. Other examples are drawn from overseas – South Africa, Canada and the UK. There are 20 pages in Appendices which provide templates for Benefits Registers, Benefits Realisation Plans, Benefits Register, Benefits Profile and so on. Effective benefits management is an essential component of project management and programme management. However, it needs to be implemented as part of an organisational approach and aligned with frameworks and processes. It impacts every major part of a business from strategic planning, finance and operations. It’s not just a matter of doing things right, but doing the right things. Value can be achieved in non-financial terms. Benefits management allows us to compare the value of alternative proposals to our organisation. This point is taken up in one of the articles in the book which argues that traditional cost-benefits analysis is not always the best tool. Click here to buy or preview the book.